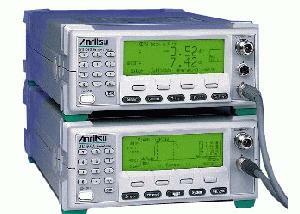 The Anritsu ML2407A/ML2408A is the ideal solution for accurate measurements of IS-95 signals, giving average, peak and crest readings Pulses down to 1 µs can be captured and displayed in graphical mode thanks to the 0.6 µs rise time of the MA2469A sensor. Test amplifiers response to narrow input pulses. This product family includes the ML2407A and ML2408A power meters, which were designed to measure the peak and average power of an IS-95 CDMA signal. ML2407A and ML2408A have a wider bandwidth (1.4MHz) than the ML2437A/38A power meters and have been designed for a standard 1.2288 Mc/s IS-95 signal channel. The MA2468B and MA2469C sensors have been specifically designed to go with ML2407A and ML2408A for this IS-95 application. ML2407A has one input, and ML2408A has two inputs. Applications needing a wider bandwidth power should also consider the ML2487A/ML2488A power meters.